While wandering around San Francisco, we ran across Morrow’s Nut House. 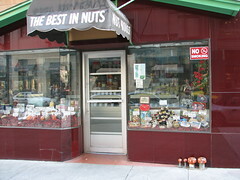 There were some very silly decorated walnuts in the window, but that’s not what caught my eye. I couldn’t take my eyes off of the toadstools just outside. These capped-off pipes had been painted red with white spots. Urban art at its finest! Of course, the name of the shop is pretty good, too. Unfortunately for us, it was closed. Next time. In the meantime, you’ve got to check out the reviews people have written about this place! This entry was posted in Art, Field Trips and tagged art. Bookmark the Permalink. 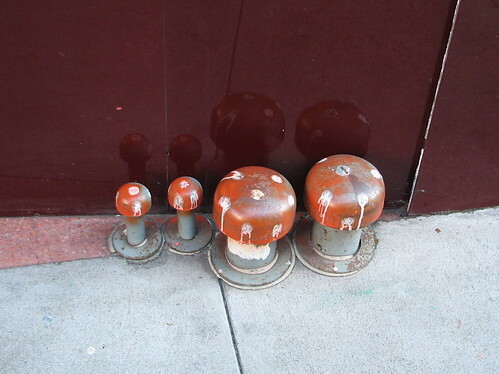 I was just going to comment that I have a picture of the same pipes in San Fransisco, but when I dug mine up, I realized they were at a different building. So I think we have a serial mushroom painter out there. I’m sorry I don’t remember exactly where this was taken, it was somewhere between the conference center and Chinatown. Is this a picture of the Geary location? If you look at Google Map’s "Streetview", the storefront looks very different. Is there a second location that I need to know about? The mushrooms are in a number of places throughout that area. Originally, most of them had little bugs or tiny people glued onto and around them. Once I even saw a troll doll glued down under one of the mushrooms. Someone out there has a fabulous imagination. I just wish the denizens of the little mushroom forests remained.